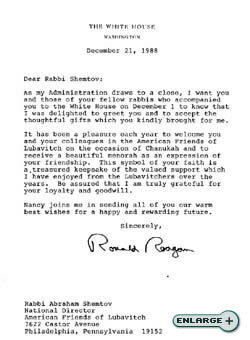 The Rebbe, Rabbi Menachem M. Schneerson, of righteous memory and President Ronald Reagan enjoyed a deep relationship for many years. 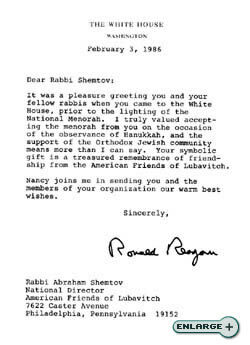 Mr. Reagan displayed a profound respect toward the Rebbe and his teachings. The President was an early and enthusiastic adherent of the Rebbe's call to make all people aware of the Seven Universal Laws, based on the belief in a Supreme Being. 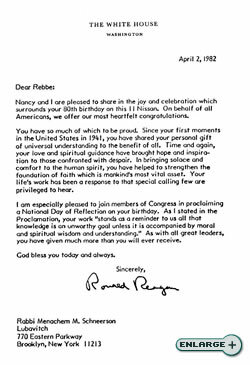 The Rebbe's call for a moment of silence in the public schools, and his persistent belief that America must export to the world faith-based moral values, were among the themes that found a welcoming ear in President Reagan. Below we bring you little windows into the relationship. A delegation of Chabad Rabbis make a presentation to the President. On April 15th, the Chabad-Lubavitch community was celebrating the 79th birthday of the Rebbe, or righteous memory. The president participated in the celebrations by sending a telegram. I am delighted to join with your many friends and followers in wishing you а very Happy Seventy-Ninth Birthday. Your dedication and devotion to the spiritual and intellectual well-being of the Jewish people are an inspiration to all Americans. For more than two centuries, the Chabad-Lubavitch Movement has been а vital force in Jewish life and culture and а source of hope and sustenance during many difficult and tragic moments in Jewish history. Thank you very much, dear Mr. President, for your good wishes on the occasion of my birthday. As I noted in my remarks at the annual celebration last night, your kind and thoughtful congratulatory message is doubly reassuring. While all of us are still under impact of the recent trying days for you and the Nation, in connection with the demented attempt on your life (Heaven forefend! ), it is remarkable, and most gratifying, that the President has been able to give personal attention also to matters which, under the circumstances, might have justifiably been postponed, or overlooked. Your message, particularly in reference to the importance of emphasizing moral and ethical values in education, is as meaningful as it is timely. It is heartening to know that you, Mr. President, and your administration are committed to upgrading the education of all the citizens of this country. Please be assured that we in the Chabad-Lubavitch movement, along with all good citizens of this country, continue to pray for your rapid and complete recovery, and for your robust health consistently thereafter, so that you can carry out the awesome responsibilities of the President of this great and leading Nation in the world. In keeping with our basic belief that everything is by Divine Providence, how much more so being elected to the highest office in the land, we are convinced that G‑d has endowed you with the capabilities and strength to carry out your G‑d-given responsibilities in the fullest measure, with joy and gladness of heart. There is no better way in which I can reciprocate your good wishes than by reiterating the Divine promise to our Patriarch Abraham, "I will bless them that bless thee" (Gen. 12:3). May you and the First Lady and all your family be blessed with all good from the Source of all blessings. Amid the distractions and concerns of our daily existence, it is appropriate that Americans pause to reflect upon the ancient ethical principles and moral values which are the foundation of our character as a nation. We seek, and steadfastly pursue, the benefits of education. But education must be more than factual enlightenment-it must enrich the character as well as the mind. 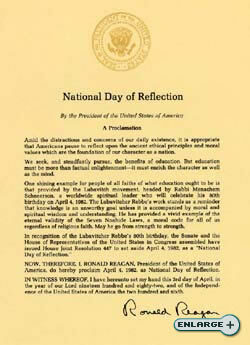 NOW, THEREFORE, I, RONALD REAGAN, President of the United States of America, do hereby proclaim April 4, 1982, as National Day of Reflection. IN WITNESS WHEREOF, I have hereunto set my hand this 3rd day of April, in the year of our Lord nineteen hundred and eighty-two, and of the Independence of the United States of America the two hundred and sixth. Nancy and I are pleased to share in the joy and celebration which surrounds your 80th birthday on this 11 Nissan. On behalf of all Americans, we offer our most heartfelt congratulations. You have so much of which to be proud. Since your first moments in the United States in 1941, you have shared your personal gift of universal understanding to the benefit of all. Time and again, your love and spiritual guidance have brought hope and inspiration to those confronted with despair. In bringing solace and comfort to the human spirit, you have helped to strengthen the foundation of faith which is mankind's most vital asset. Your life's work has been a response to that special calling few are privileged to hear. 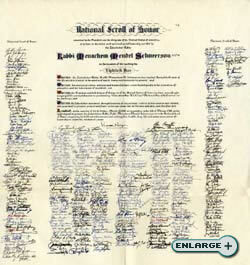 I am especially pleased to join members of Congress in proclaiming a National Day of Reflection on your birthday. As I stated in the Proclamation, your work "stands as a reminder to us all that knowledge is an unworthy goal unless it is accompanied by moral and spiritual wisdom and understanding." As with all great leaders, you have given much more than you will ever receive. 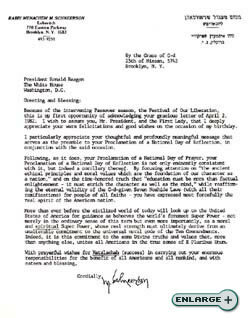 Because of the Intervening Passover season, the Festival of Our Liberation, this is my first opportunity of acknowledging your gracious letter of April 2, 1982. I wish to assure you, Mr. President, and the First Lady, that I deeply appreciate your warm felicitations and good wishes on the occasion of my birthday. I particularly appreciate your thoughtful and profoundly meaningful message that serves as the preamble to your Proclamation of a National Day of Reflection, in conjunction with the said occasion. Following, as it does, your Proclamation of a National Day of Prayer, your Proclamation of a National Day of Reflection is not only eminently consistent with it, but indeed a corollary thereof. By focusing attention on "the ancient ethical principles and moral values which are the foundation of our character as a nation," and on the time-honored truth that "education must be more than factual enlightenment - it must enrich the character as well as the mind," while reaffirming the eternal validity of the G‑d-given Seven Noahide Laws (with all their ramifications) for people of all faiths - you have expressed most forcefully the real spirit of the American nation. More than ever before the civilized world of today will look up to the United States of America for guidance as behooves the world's foremost Super Power - not merely in the ordinary sense of this term but even more importantly, as a moral and spiritual Super Power, whose real strength must ultimately derive from an unalterable commitment to the universal moral code of the Ten Commandments. Indeed, it is this commitment to the same Divine truths and values that, more than anything else, unites all Americans in the true sense of E Pluribus Unum. It was a special pleasure for me to greet you and your distinguished colleagues in the American Friends of Lubavitcher and to have our photograph taken together. I want to thank you for the inscribed copy of Letters by the Lubavitcher Rebbe and assure you of my deep appreciation for the friendship and goodwill that prompted your giving me this handsomely bound collection of the wise counsel of Rabbi Menachem Schneerson. It certainly will be a meaningful addition to my library. Following the signing of the proclamation of “Education Day U.S.A.,” President Ronald Reagan presents the pen he used to sign the proclamation to Rabbi Abraham Shemtov, National Director of American Friends of Lubavitch and the Rebbe's ambassador to the White House. It was a pleasure to greet you and your colleagues in the American Friends of Lubavitcher when you came to the White House on the eve of Hanukkah 1984. You were most kind to present me with the beautiful silver menorah and I truly appreciate the friendship that prompted your symbolic remembrance. May the light of the menorah always be a source of strength and inspiration to the Jewish people and to all mankind. Very few Americans have done more to promote these ethical values as the basis of civilization than Rabbi Menachem Mendel Schneerson, the leader of the worldwide Lubavitch movement. The word "Lubavitch" comes from the name of a Russian city and means city of love. That is very appropriate because, of all the ethical values which inform our civilization, none is more important than love-love of wisdom, love of our fellowman, and love of our Creator. 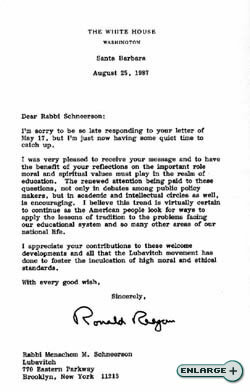 In recognition of Rabbi Schneerson's contributions and in honor of his 83rd birthday, which falls this year on April 2, the Congress, by House joint Resolution 186, has designated April 2, 1985, as "Education Day, U.S.A." and authorized and requested the President to issue an appropriate proclamation in observance of this event. NOW, THEREFORE, I, RONALD REAGAN, President of the United States, of America, do hereby proclaim Tuesday, April 2,1985, as Education Day, U.S.A., and I call upon the people of the United States, and in particular our teachers and other educational leaders, to observe that day with 'appropriate ceremonies and activities. IN WITNESS WHEREOF, I have hereunto set my hand this 4th day of April, in the year of our Lord nineteen hundred and eighty-five, and of the Independence of the United States of America the two hundred and ninth. .
From earliest colonial days, Americans have always known that education is the golden key that opens the door to achievement and progress. This Administration has placed renewed emphasis on excellence in education, and already the results are encouraging. By setting high standards we challenge the young to stretch their mental muscles and strive to achieve the best that is in them. Such an education succeeds because it makes learning an adventure. Education is like a diamond with many facets: it includes the basic mastery of numbers and letters that give us access to the treasury of human knowledge, accumulated and refined through the ages; it includes technical and vocational training as well as instruction in science, higher mathematics, and humane letters. But no true education can leave out the moral and spiritual dimensions of human life and human striving. Only education that addresses this dimension can lead to that blend of compassion, humility, and understanding that is summed up in one word: wisdom. "Happy the man," Scripture tells us, "who finds wisdom. ... Her ways are ways of pleasantness, and all her paths are peace. She is a tree of life to those who come to possess her." The Congress has sought to call attention to these durable values by adopting resolutions that pay tribute to the example of Rabbi Menachem Mendel Schneerson, a man who has dedicated his life to the search for wisdom and to guiding others along its pathways. He exemplifies the rich tradition of the Seven Noahide Laws, which have been the lodestar of the Lubavitch movement from its inception. In recognition of Rabbi Schneerson's noble achievements and in celebration of his 84th birthday, the Congress, by House Joint Resolution 582, has designated April 20 as "Education Day, U.S.A." and authorized and requested the President to issue an appropriate proclamation in observance of this event. 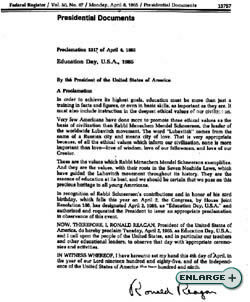 Now, Therefore, I, Ronald Reagan, President of the United States of America, do hereby proclaim Sunday, April 20, 1986, as Education Day, U.S.A., and I call upon the people of the United States, and in particular our teachers and other educational leaders, to observe that day with appropriate ceremonies and activities. In Witness Whereof, I have hereunto set my hand this nineteenth day of April, in the year of our Lord nineteen hundred and eighty-six, and of the Independence of the United States of America the two hundred and tenth. It was a pleasure greeting you and your fellow rabbis when you came to the White House, prior to the lighting of the National Menorah. I truly valued accepting the menorah from you on the occasion of the observance of Hanukkah, and the support of the Orthodox Jewish community means more than I can say. Your symbolic gift is a treasured remembrance of friendship from the American Friends of Lubavitch. Nancy joins me in sending you and the members of your organization our warm best wishes. Once again, dear Mr. President, it is a genuine pleasure to acknowledge your kind felicitations on the occasion of my recent birthday. I was impressed with your meaningful Proclamation of "Education Day, USA" in connection with the Joint Resolution of the United States Congress, and I sincerely appreciate your heading the roster of signatories to the "International Scroll of Honor" affiliated with it. Its mention of "the historical tradition of ethical values and principles, which have been the bedrock of society from the dawn of civilization when they were known as the Seven Noahide Laws, transmitted through G‑d to Moses on Mount Sinai," is a clarion call vital to all mankind. Furthermore, it is particularly gratifying that you use this occasion to bring to the attention of the Nation and of the International community the need of upgrading education in terms of moral values, without which no true education can be considered complete. 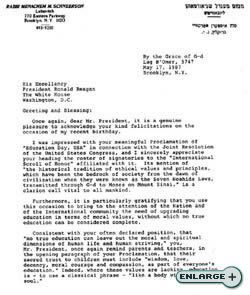 Consistent with your often declared position, that “no true education can leave out the moral and spiritual dimensions of human life and human striving," you, Mr. President, once again remind parents and teachers, in the opening paragraph of your Proclamation, that their sacred trust to children must include "wisdom, love, decency, moral courage and compassion, as part of everyone's education." Indeed, where these values are lacking, education is - to use a classical phrase - "like a body without a soul." With the summer recess approaching, one cannot help wondering how many juveniles could be encouraged to use their free time productively, rather than getting into mischief - if they were mindful of - to quote your words - a Supreme Being and a Law higher than man's. I take this opportunity of again acknowledging very gratefully your kind sentiments and good wishes. I'm sorry to be so late responding to your letter of May 17, but I'm just now having some quiet time to catch up. I was very pleased to receive your message and to have the benefit of your reflections on the important role moral and spiritual values must play in the realm of education. The renewed attention being paid to these questions, not only in debates among public policy makers, but in academic and intellectual circles as well, is encouraging. I believe this trend is virtually certain to continue as the American people look for ways to apply the lessons of tradition to the problems facing our educational system and so many other areas of our national life. I appreciate your contributions to these welcome developments and all that the Lubavitch movement has done to foster the inculcation of high moral and ethical standards. Thank you very much, Mr. President, for your very kind letter of August 25, 1987. Your thoughtful and warm sentiments are certainly most encouraging and stimulating. I want you to know, dear Mr. President, that from the reports reaching me from our emissaries in most States of the Union and in many major centers and outposts in various parts of the world, it is particularly gratifying to note that your consistent, often courageous, leadership in areas of the traditional American and universal values is finding an increasingly receptive response. This is even more evident in the realm of education, as you rightly note in your letter. Similarly, we have reason to believe that your forceful supportive stance to help upgrade the moral standards of human relationships on the basis of the so-called Seven Noahide Laws (with all their ramifications) as imperatives of a Supreme Being who monitors all human conduct, has made a great impact on the consciousness of the contemporary troubled generation of mankind. I consider it particularly relevant to mention the above at this time, as we approach Rosh Hashanah (lit. the "head" of the year) in our Jewish calendar. Rosh Hashanah, as you surely know, is the anniversary of the creation of man, and thus also of the "Coronation" of the Creator as "King of the Universe." This Day is, therefore, a most auspicious occasion in Jewish tradition, the day when the Supreme King of Kings bestows His blessings on humankind, nations as well as individuals, graciously and generously. In light of the above, your lasting contribution, through word and deed, to the advancement of all inhabitants in this blessed land and of humanity at large, will surely stand you in good stead for a goodly measure of Divine blessings. Including, especially, the blessing of vigorous good health to continue from strength to strength in all your good endeavors. May I add, Mr. President, that the current year in the Jewish Calendar (5747) is a "Sabbatical Year" (Leviticus 25:1-7). One of the underlying purposes of this unique institution, which calls for rest from certain agricultural activities, is that it provides additional time which should be spent on more intensive study, and on activities dedicated to morally uplifting pursuits. This lesson has special significance in this day and age, when, largely as a result of what you rightly call incomplete education, moral and ethical standards have not kept pace with technological advancement. In conclusion, I wish to assure you, dear Mr. President, that I deeply appreciate your personal warm sentiments and good wishes, which I heartily reciprocate in the words of our Sages, "Whoever blesses others is blessed by G‑d Himself," the Source of All Blessings, in a generous measure. Nancy and I send our heartfelt condolences as you mourn the loss of your wife. Although there are no words to ease the deep sorrow you feel, we wanted you to know that we are keeping you and your family in our prayers. Rebbetzin Chaya Moussia's long and fruitful life was a shining example of the scriptural values that Americans deeply cherish: love of the Almighty and our neighbor, humility, wisdom, and compassion. She truly personified in her own words and actions the ethical values and principles of the Chabad-Lubavitch movement. Her life has been a continuing source of inspiration not only to world Jewry, but to all men and women of goodwill. She will be as sorely missed as she was deeply loved. We pray that warm memories of Rebbetzin Chaya Moussia will be a source of peace and strength in the coming days. May every consolation be yours. I deeply appreciate your kind and warm words of sympathy. We are, indeed, consoled by the abiding thought that the dear departed has left behind her a legacy of a lifetime spent here on earth in good deeds which live on, and continue to grow; and, of course, growth is a sign of true vitality. And her eternal soul - reflected in the ongoing activities of the institutions - will continue to be a source of inspiration and encouragement, especially to all whose lives were touched by hers. In the Torah, an expression of sympathy in a time of grief, invoking solace from the One Above who is the true source of Consolation, is termed a "Blessing of Condolence," and is reciprocated with the words, "May you be blessed from Heaven." I do so reciprocate your blessing. Needless to say, a blessing from Heaven, the Source of All Blessings, is replete and boundless with all good. I only add my prayerful wish that it be "in the kind of good that is revealed and obvious" - not only in Heaven, but also here on earth. As my Administration draws to a close, I want you and those of your fellow rabbis who accompanied you to the White House on December 1 to know that I was delighted to greet you and to accept the thoughtful gifts which you kindly brought for me. It has been a pleasure each year to welcome you and your colleagues in the American Friends of Lubavitch on the occasion of Chanukah and to receive a beautiful menorah as an expression of your friendship. This symbol of your faith is a, treasured keepsake of the valued support which I have enjoyed from the Lubavitchers over the years. Be assured that I am truly grateful for your loyalty and goodwill. Nancy joins me in sending all of you our warm best wishes for a happy and rewarding future. Our thanks to Rabbi Abraham Shemtov, national director of American Friends of Lubavitch and the Rebbe's ambassador to the White House, for supplying us with many of these priceless documents so that we may share them with the public. 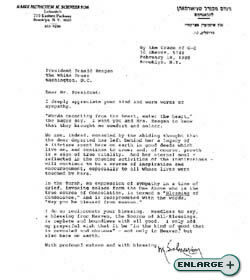 I notice that when Regan sent notification to Blessed Rabbi Schneeson that a day of moral reflection was to be held on his birthday; he neither accepted this honour or glory but rather reminded USA that morals and virtues are not simply products of once a year reflection, but attributes to be practised constantly. And that a superpower such as America should take a leading role in this. 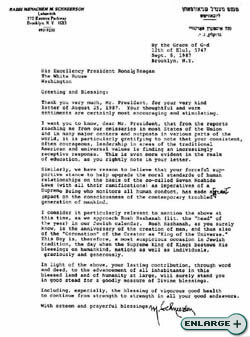 Info from "The Rebbe's Army" On page 193 (Reagan passed away at the age of 93), the author states that President Reagan and the Rebbe corresponded on a regular basis. 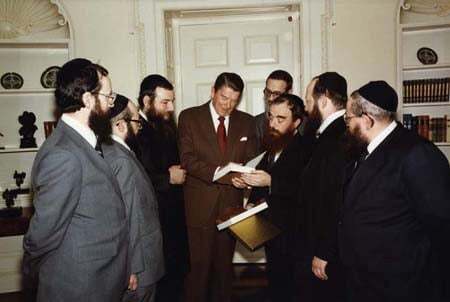 Of all U.S. Presidents, Reagan was the closest to Chabad. Chabad Shlichim were one of the first visitors to the White House and they visited the former President on his last day in office. A Russian general stated that the fall of the Soviet Union started when Reagan called it the "evil empire." As we all know, communism, the first phylosophy in history to deny the existence of G-d, fell without firing one shot. Such is the power of one's speach (dibbur) and strongly held convictions (machshava). 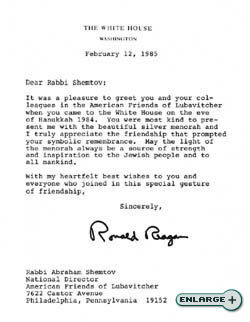 Reagan was God's emissary in bringing this about which also led to many thousands of Soviet Jews leaving and going to countries in which they could practice their Judaism. It also opened the borders for emissaries to help those Jews who remained. 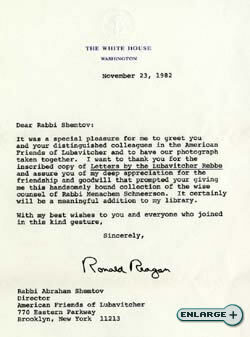 ronald reagan and the rebbe very touching this relationship between the rebbe and ronald reagan. may g-d bless both wonderfull man in heaven. and may this relationship between the presidents of th USA and chabad endure forever. I just wanted the Chabad.org team to know that I was very touched and inspired by being exposed to the beautiful relationship between the Rebbe and President Reagan. It is obvious the president truly admired the Rebbe and it is just so nice to read about. President Ronald Reagan signs a declaration proclaiming 11 Nissan 5742, April 4, 1982 -- the Rebbe's 80th birthday -- as a "National Day of Reflection"
President Ronald Reagan is presented with a Menorah; the menorah represents the "victory of spiritual powers over secularism"
Speaking to a worldwide television audience, the Rebbe mentions President Reagan's work in a discussion about the United States, religious freedom and Chanukah. The talk was given a few days prior to the presentation below. President Ronald Reagan is presented with a Menorah a second time.